It’s a myth that men can get ready in 10 minutes and a woman needs hours to get the look which is appreciated by every single human being. Male species got no less jewels and accessories than that of Female which are supposed to be worn with some basic etiquette. Being itself a well mannered wearable, The Bespoke suits should be paired with few respectable accessories. 1. Shoes say all about you! Ask any woman what is the first thing a woman looks at and she will tell you…the shoes! Shoes are most important part of any outfit. Wearing a professional and classy pair of shoes is must to match a well tailored suit. Remember, your office isn’t a party place or a yacht. Loafers are not meant to be worn with custom suit. You might think that socks don’t make much difference, but they can actually work for you to round out your look. Match your socks to the suit pants instead of your shoes because when you are sitting out, you might not like your boss, client or your date to see mismatched socks poking out of your pant cuffs. Always wear a belt when wearing pants with belt loops. You shall match the color of the belt to that of the shoes. Consider getting a reversible belt (black on one side, brown on the other) and it can change the look of your suit quit visibly. Depending upon the choice, you can wear different design of ties. A contrast shade would definitely make you mark being an eyepopper. A Tie bar or a clip keeps your tie from flying over your shoulder and from dropping into your food at a meal. 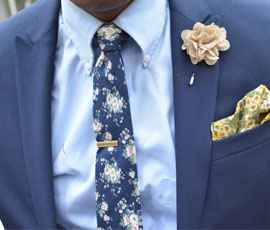 A pocket square or a pocket circle may only peek an inch or a little more out of your suit pocket, but it can add a world of vogue to your overall look. Pick a solid colour that matches your tie for a subtle look. Look for different ways to fold your square. Any electronic gadget we are surrounded with cannot replace the charm of the watch. It is still a classic accessory which makes a statement. Restrain yourself from wearing a sports watch with Bespoke suit. A wristwatch should be lean, plain, and elegant; alternatively, a pocket watch may be worn on the waistcoat. So while you are stepping in The Board Room or The Ball Room, make sure you hit it in heavenly style.